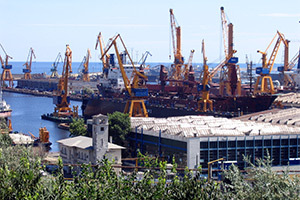 The Port of Constanta is located on the Western Coast of the Black Sea, at 179 Nm from the Bosphorus Strait and 85 Nm from the Sulina Branch, through which the Danube flows into the sea. It covers 3,926 ha of which 1,313 ha is land and the rest of 2,613 ha is water.The two breakwaters located northwards and southwards shelter the port creating the safest conditions for port activities. The present length of the North breakwater is 8,344 m and the South breakwater is 5,560 m.
Constanta Port has a handling capacity of 100 million tons per year and 156 berths, of which 140 berths are operational. The total quay length is 29.83 km, and the depths range between 8 and 19 meters. These characteristics are comparable with those offered by the most important European and international ports, allowing the accommodation of tankers with capacity of 165,000 dwt and bulk carriers of 220,000 dwt. The observance of 1972 COLREG is compulsory. The length of the navigational channel is 6.4 Nm, depth is 21 m. The breadth of the navigational channel is 0.8 Nm. The width of the separation zone is 0.5 Nm. Compulsory for all vessels, except navy vessels, vessels used in public service, vessel for maintenance or for the control and surveillance of navigation, intervention vessels, training, hospital and pleasure vessels. Pilotage is compulsory for berthing, unberthing, shifting and is available 24hours/day. The vessel’s Master has to contact Constanta VTS / VHF Ch 67 at the entrance into the jurisdiction zone (12 Nm radius from position: 44°10.20’N 028°39.60’E). Pilot can be contacted in VHF Ch 14. In fair weather (the wind force up to 4): within the circle with a radius of 0.5 Nm from position: 44°05.06’N 028°43.06’E. In bad weather (over force 4) near the position 44°06.24’N 028°42.30’E. The roadstead allows safe anchorage, with depths of 25-30m for 40 to 50 large ships, with the possibility to make a full swing in case of change of wind or current direction. In bad weather, small vessels may enter the port waters with the approval of the Constanta VTS only. 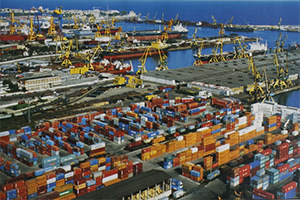 As the commercial limits, the port of Constanta is confined by the North and South breakwaters. Prevailing winds: beginning with October and all winter, there are strong northerly winds (up to 9 to 10 Beaufort). In the summer time, variable winds, sometimes rainfalls. The Romanian maritime ports are provided with a modern maritime signaling system: light buoys and radar reflectors. Radar surveillance is permanently performed by Constanta VTS on 12 Nm radius area. The master of the vessel is obliged to be in permanent contact with Constanta VTS (VHF Ch 67) starting from the vessel’s entrance into the jurisdiction zone, at anchor also. Entering/leaving in/from the port and also the maneuvers inside the anchorage zone will be made with the approval of the Constanta VTS only . Entrance to the port during night-time is forbidden for tankers with a draft over 11 m. Tug assistance is compulsory for any vessel over 1,000 NRT as well for tankers regardless of size.